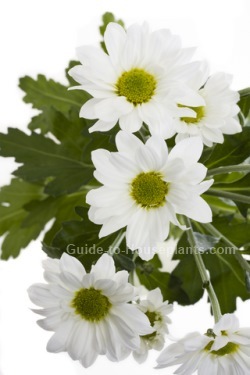 Florist Chrysanthemum has big, beautiful flowers crowning a mass of dark-green foliage. This is a member of the Asteraceae family, along with daisies, sunflowers and marigolds. Chrysanthemum gets its name from the Greek words chryos, meaning gold, and anthemom, meaning flower. These "golden flowers" are now available in shades of pink, purple, red, burgundy, white, and yes -- golden yellow. The secret to keeping blossoms fresh for several weeks is to keep mums in a cool place and well-watered. Florist mums are not hardy for growing outdoors in cold climates. This is a tender variety sold in florist shops and wants to stay indoors with you. Choose a plant with plenty of buds that are just beginning to open. 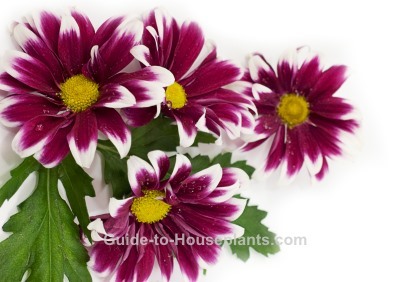 If your florist chrysanthemums came with a plastic covering over the pot, remove it. Your mums need plenty of air circulation. Plus, you don't want to block the nursery pot's drainage holes. You can cover a plain nursery pot by slipping it into a cachepot -- a decorative pot without drainage holes. I put pebbles in the bottom of cachepots to keep the pot above the drainage water. Give your plant a cool, bright location, and you can expect blooms for about 6 to 8 weeks. Unfortunately, it's difficult to get mums to rebloom, so it is treated as an annual and tossed out after the blooming season is over. You can put your plant outdoors in the spring to possibly get another season of blooms, but it will never look as good. Although temporary houseguests, these beautiful mums work hard at removing air pollutants found in homes caused by the chemicals in upholestery, paint and carpet. 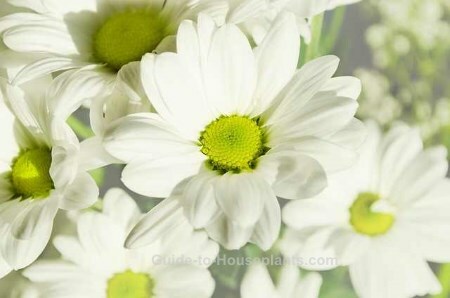 Florist mums are one of the best flowering plants for purifying indoor air of formaldehyde, benzene and ammonia. Find out more about air-cleaning house plants. CAUTION: Chrysanthemum leaves are poisonous. Keep out of the reach of children and pets that may play with or ingest this plant. Light: Bright light. Flower buds may fail to open without enough sunlight. Keep your mums out of hot, direct sun because they can't take the heat. Water: Keep soil evenly moist at all times. Foliage will wilt if the roots are too dry. Flowering plants are thirsty, so check the soil often. Humidity: Average room humidity (around 40-50% relative humidity). If indoor air is dry, try one of these easy ways to increase humidity for your houseplants. Temperature: Cool temperatures 55-65°F/13-18°C; Flowers may not last as long if kept in a warm room.